Need a place to stay during your visit? How about the bed & Breakfast at Tithe Barn? With its roots in the 15th century, and beautiful surroundings, this could be the place for you. Please visit the owners website for full details. There are so many reasons to visit the beautiful county of Rutland – this idyllic rural destination offers the ideal antidote to the hustle and bustle of daily life. Situated in the heart of the East Midlands, the smallest county in England is very easy to access from all directions and is the perfect location for short breaks in the UK. Greetham Valley in Rutland offers a choice of superb accommodation nestling in a lovely rolling landscape, plus an excellent selection of activities on-site and nearby. Guests can choose to stay in our contemporary AA 3* Hotel, which has 35 en-suite bedrooms, or for those who prefer self-catering, in one of our three bedroom VisitBritain 4* Rutland Lodges or our country cottage. All Greetham Valley’s accommodation is just a few minute’s walk from the two 18 hole championship standard golf courses, the Lakes and the Valley, our nine hole par 3 Academy course and Driving Range. Also on-site, guests will find archery, outdoor bowls, petanque, fishing (coarse, trout and salmon in dedicated lakes), quad biking and 4×4 driving. And if that is not enough, nearby Rutland Water offers a host of amenities including birdwatching (the Osprey Project is an absolute must-see), sailing, windsurfing, flyfishing, cycling – the list goes on! The new Rocks by Rail Living Museum just a few minutes’ drive from Greetham Valley is a superb attraction for all the family, whilst some of the castles and stately homes of Hidden England are close by – Burghley House, Rockingham Castle, Belvoir Castle, Grimsthorpe Castle to name a few. For the gardeners amongst you, Geoff Hamilton’s Barnsdale Gardens, now owned and beautifully extended by his son Nick, are five minutes away, plus Gates’ Nurseries and Ashwell Nursery should both be visited. So much more to do here in Rutland – where will you start? If you are planning a visit to Rutland and our museum, why not combine it with a few nights stay in a beautifully restored 5 star stone cottage in the Rutland village of Manton. Situated on the south shore of Rutland water it offers you easy access to the three picturesque market towns of Oakham, Uppingham and Stamford and is only a 10 minute drive to our museum. Prices start from as little as £275 for a three night mid-week stay and the Manton Cottage can sleep upto 6 guests in 2 double bedded rooms and one twin room. When visiting the Museum you may want to stay locally to explore all that Rutland has to offer and Puddle Cottage is offering a 10% discount off any booking as well as a bottle of wine on arrival for visitors to the Museum. Please mention when booking that you are visiting the Museum. Puddle Cottage is a 4 star self-catering cottage located in the popular village of Edith Weston and with one large bedroom which can offer either a super king sized bed, or two full size single beds, the cottage can sleep two comfortably. Puddle Cottage offers the traditional charm of a cottage, maintaining its original stone walls, exposed timberwork and open fire. Yet it offers all the modern facilities you would expect such as a recently renovated bathroom, gas central heating, and a large flat screen TV with Freeview and DVD player. WIFI is also available to guests free of charge. 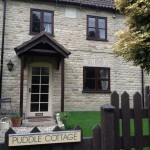 The cottage is just a short walking distance to the shores of Rutland Water, and within 8 miles of Puddle Cottage also lie the market towns of Oakham, Stamford and Uppingham making the cottage the ideal place to explore all that Rutland has to offer. More details can be found on their website www.puddle-cottage.co.uk.